This Chorizo and potato frittata takes its inspiration from the gutsy flavours of a Spanish paella. Whether you call it a tortilla or frittata, it happily accommodates whatever the fridge offers up. Baked until golden and poufed, it’s one of the simplest ways to get supper on the table. For this tapas-style supper, I’ve used chorizo, mushrooms, sweet peppers and potatoes. I love the intense saltiness of chorizo. This spicy sausage is perfect for pastas, chicken casseroles and pizza toppings. Here, I’ve paired it with mediterranean potatoes, which have a waxier texture than starchy baking varieties. Remember to roast them before adding them to the frittata. Also, use a stealthy cheddar, one that can holds its own against the chorizo. 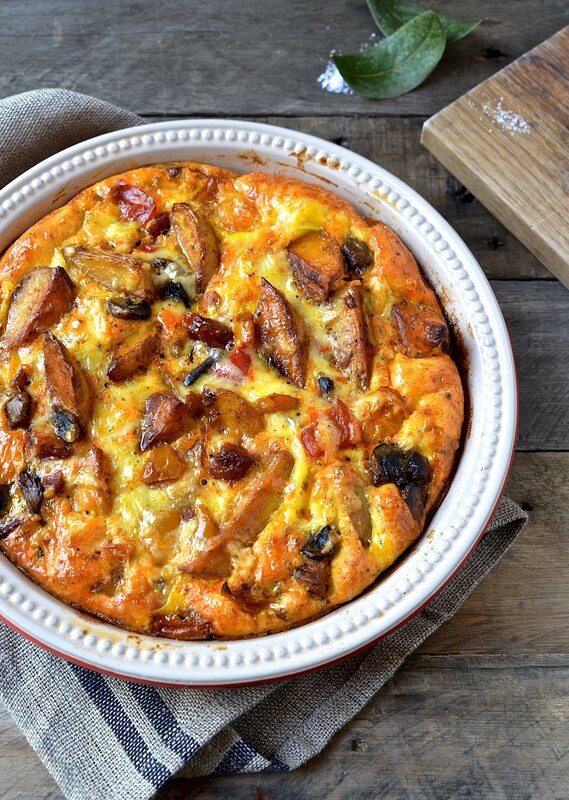 Frittatas travel well and make excellent picnic food. 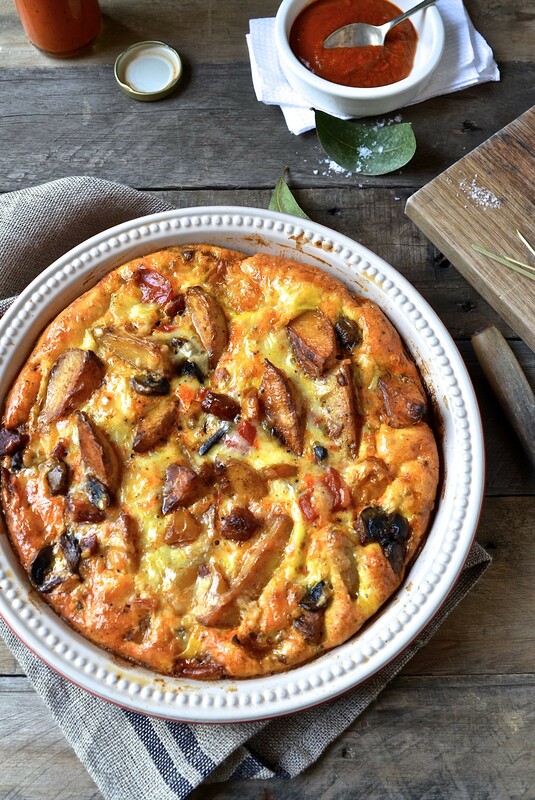 I serve this frittata with my homemade smoky tomato sauce and a fresh green salad for an easy weeknight supper. 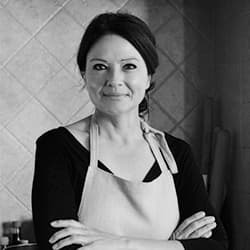 Preheat the oven to 180º C. Grease a 25 cm round baking dish. Cut the potatoes into wedges and boil in salted water until fork tender. Drain thoroughly and pat dry with a paper towel. Set aside to cool. In a wide based frying pan, sauté the onions in some olive oil until softened. Add the sweet peppers and cook for several more minutes. Move the peppers and onions to the sides of the pan, pour in a little more olive oil and add the mushrooms. Cook the mushrooms on a high heat until nicely coloured and all the water has evaporated. Season with salt and freshly ground black pepper. Transfer the vegetables to a plate and set aside. In the same pan heat 2 tablespoons olive oil. Add the chorizo and potatoes to the hot oil. Brown on both sides. Season the potatoes generously with salt and black pepper. Add the paprika, chilli and oregano. Return the mushrooms and sweet peppers to the pan and toss through to coat in the pan oils. Transfer the filling to the baking dish. In a mixing bowl, whisk together the eggs, cream, salt and pepper. Fold through the cheese. Pour the egg custard over the chorizo filling and bake for 35 – 40 minutes until golden and puffed. Thanks Da. Hope you enjoyed your lunch! I tend to eat a lot of fritattas because they are so easy to make, are great for breakfast, lunch or dinner & still taste delicious after re-heating. 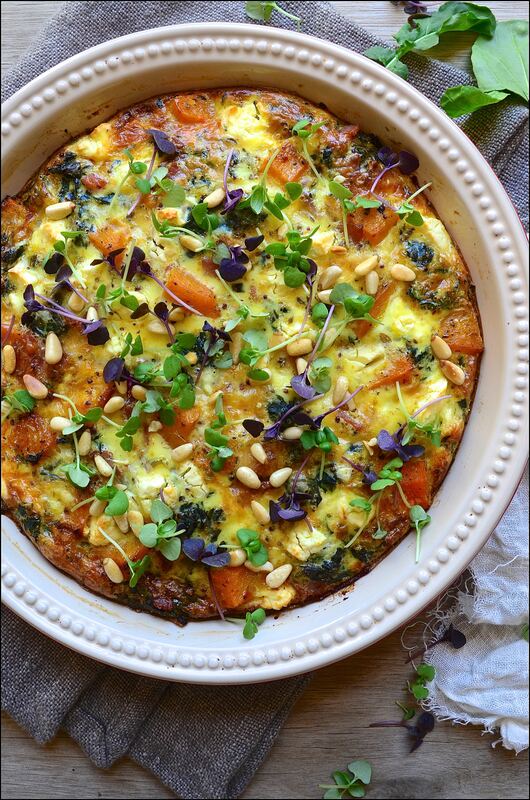 Your frittata is absolutely stunning and I love the idea of including roasted sweet potatoes. Thank you Lynn. I totally agree. It’s an all-day kind of food that you can add just about anything! It’s a pleasure Mari. Frittatas are just so quick to make and just as good reheated for a take to work lunch.